After a hearty breakfast at Bruno’s bar and grill just off the main street of Banff, Gemma, myself and our trusty Dodge (you can picture the General Lee from Dukes of Hazard if it helps) headed back into the mountains. 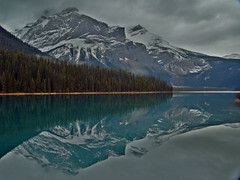 We had a tip off that a place called Emerald lake was worth a visit and would provide a good destination for a short walk. So about an hour in the car and we were back in British Columbia (don’t tell Budget Rentals). We walked about 2kms around the lake before turning back. The view from the parking lot is actually much more picturesque than from the other end of the lake but it was nice walking in the crisp pine scented mountain air.